Welcome to The Underworld, where after dark anything can happen…. Take a voyage through a dark queen’s vision where a boudoir circus of reprobates is nurtured at her strict bosom. Join her band of loyal, acrobatic henchmen as they bend to their mistresses will. Watch as innocents and outcasts alike perform to satisfy her needs. A peek below will find brainwashed boys twisted on straps, girls imprisoned in glass bowls contorting to escape, magical mermaids writhing in nets, conjoined twins on the doubles trapeze, wild cats spinning above on ropes, lost lovers on the silks, and triples trapeze courtesans beating to her will. For the queen shall take all her creatures down to the fire that burns at the heart of her world and there they shall play forever. 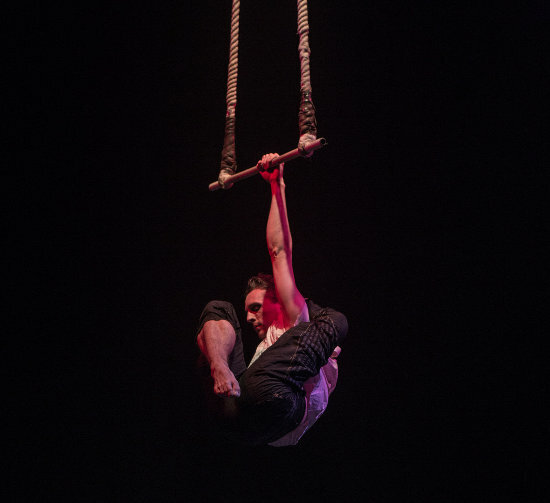 Support: The company are looking for advice on how to shape their current and future shows to suit the requirements of venues and creative programmers. 2 single points minimum loading 750kg each for 2 lifting systems. Multiple rigging points to rig triples and doubles trapeze, or depending on venue the company may need to under-hang a 3-4m stick of truss which can be down-guyed into position. 4 down-guy anchor points.